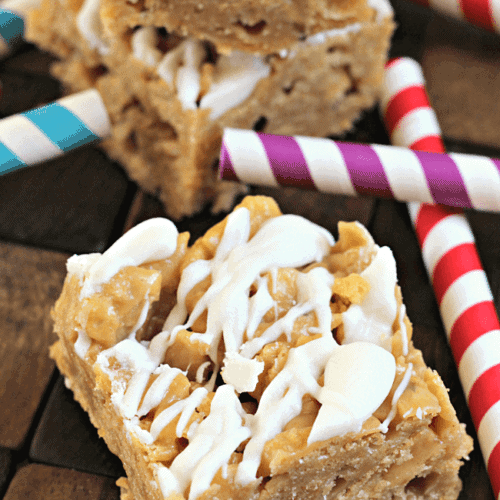 White Chocolate Frito Bars ~ These gooey bars are the perfect sweet and salty combination we all love and crave! You know a treat is good when your co-workers from different offices start emailing and calling you about the bars that someone brought in. I would like to refer to these bars as “Crack”. They have the perfect amount of salty and sweet combined in one amazing bar. Take the Frito, which on it’s own is pretty dang amazing in my opinion, then top it with a peanut butter sauce and vanilla Candiquick. Life changing. It’s like a plain old Scotch-a-roo, which really knocks my socks off, amped up on crack. So it knocks my clothes off. Well, not really cause no one wants to see that, but you get the picture. 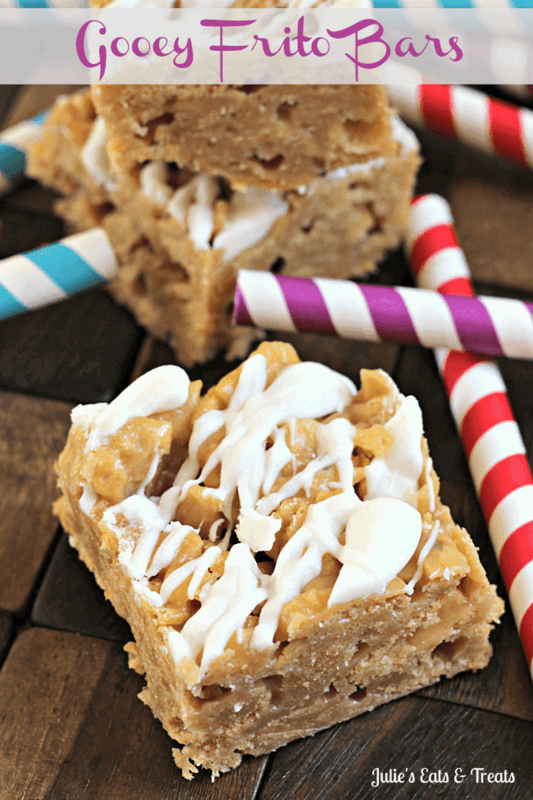 If you are looking for a sweet and salty treat that will become famous when you make them here you go. Just be prepared for a lot of guests and unexpected friends to come over as you become the talk of the town! Pour Frito Scoops into a gallon ziplock bag. Crush until they are in large pieces. Pour into a large bowl. In a medium saucepan combine sugar and white syrup. Bring to a rolling boil and boil for 1 minute. Remove from heat and add peanut butter and vanilla. Stir until peanut butter is melted and combined. Pour over Frito's and mix well. Pour mixture into a greased jelly roll pan. Melt CandiQuick according to package directions. Drizzle over bars. What a fun salty/sweet twist. I heart Fritos!! It’s like a perfect marriage of food!! What a crazy awesome combo! I love sweet and salty! My son would love me forever if I made these for him:) Thanks so much for posting this great recipe!! Frito bars- what is the pan size? These look amazing! Any idea how these might hold up and stay fresh if shipped? My son is deployed overseas and I am wanting to send a goodie/care package. Thanks! I make a frito sweet dish that I call crack, too! It is so addictive that I have to be very selective when I make it so I don’t eat it all! I can’t wait to try your recipe. I can’t believe I just left a comment but didn’t write my website correctly! Long day! LOL glad I’m not the only one! I live in Australia, and I’ve never heard of frito. Could you please explain what it is..
It’s a thick, salty corn chip! Hi I’m in the UK, Can you tell me what Fritos scoops are please? Not sure we have anything like that here. We don’t have Fritos here in Brazil… Is Doritos the same kind of snack? Can I use it for this recipe? Thanks!